Please fill in the below information to receive a copy of the report. LONDON AND NEW YORK, Dec. 5th, 2016 – WPP’s GroupM, the world’s leading media investment group, today affirmed its 2016 global ad expenditure forecast and shared its revised outlook for 2017. A variety of economic factors across the globe see another year of modest growth in advertising as brands continue to be pressured for performance in low-growth environments. Despite the overhang of uncertainty tied to outcomes of the U.S. Presidential election and the U.K. referendum on departing the European Union, advertising budgets have not yet been impacted. China and other “new world” countries continue to over-contribute to global growth, but a new normal more modest level of growth has settled in. Digital advertising continues to be the chief beneficiary of growth. 2017 advertising is predicted at $547 billion (+ 4.4 percent), with digital’s share to reach 33 percent. In 2016, digital captured 72 cents of every new ad dollar (USD), and TV 21 cents. In 2017, digital will capture 77 cents per new dollar, TV will get 17 cents. The U.S. and China account for half of all net growth in the 2016 and 2017, with China taking back a narrow lead over the U.S.
With late-year growth, GroupM China revises 2016 to +7.8 percent, up from 6.6 percent predicted earlier. FMCG advertising rose 4.6% in the second quarter year-on-year, much faster than the 2.0% growth forecasted. Continuing urbanization and solid consumer confidence lend ample support for continued growth, but China no longer boasts recent double-digit rates. Coming off of peak growth, GroupM expects digital advertising in China will grow 29.5% in 2016 and slow to 21.5% next year. The U.S. remains the other principal growth contributor. 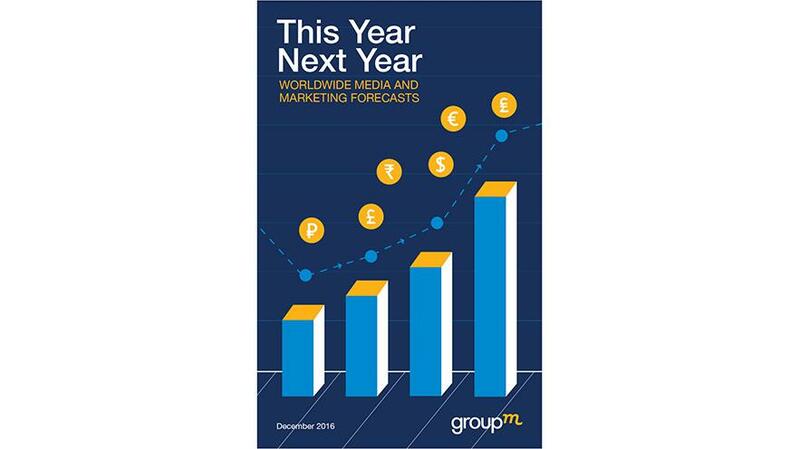 GroupM fractionally upgrades 2016 growth from 3.1% to 3.2%. This includes revising TV from 3.4% to 4.1%, matching growth in the preceding election years (2012, 2014). This year’s less robust election spending was compensated with Summer Olympics demand. There was some redirection of budgets from digital to TV, particularly by the pharmaceutical and CPG categories. For 2017, GroupM shaves growth to 2.6% on the basis of the weak global and U.S. GDP growth, and political uncertainty which as yet has not impacted budgets. The U.K. Brexit vote has impacted financial markets, but to date has not impacted advertising. GroupM recently revised its U.K. forecast up to a digital-fueled 7% annual run-rate, delivering a prospective $3.0 billion incremental investment over the two years 2016-2017. This compares to $3.3 billion from the rest of the EU combined. Elsewhere in the BRICS, GroupM sees that Brazil is emerging from recession, after reaping Olympics benefits. There is increased digital adoption, particularly in mobile; since the beginning of the year mobile users grew 22% to reach 74 mm. Modest ad growth of 2% in 2017 is predicted, enough to keep Brazil the world's number-five ad economy (USA, China, Japan, UK, Brazil, Germany). India remains, by far, the fastest growing market in the world's ten, $10B plus ad markets. Growth is forecast at 13.8% in 2016 and 12.5% in 2017, with an economy fueled by low interest rates, sustained urban demand and the impact of key reforms. Russia’s rapid recovery since the first quarter continues, prompting revision of the 2016 forecast up to 9.5%. Higher demand for TV in Q4 and growth in paid search are key contributors. While over half of paid search demand is from smaller businesses that cannot afford other media, demand from larger advertisers is strong as well. Ten percent growth is predicted for 2017, driven by TV and Internet. GroupM is the leading global media investment management group serving as the parent to WPP media agencies including Mindshare, MEC, MediaCom, Maxus, Essence and m/SIX, as well as the programmatic digital media platform, Xaxis, each global operations in their own right with leading market positions. GroupM’s primary purpose is to maximize the performance of WPP’s media agencies by operating as leader and collaborator in trading, content creation, sports, digital, finance, and proprietary tool development. GroupM’s focus is to deliver unrivaled marketplace advantage to its clients, stakeholders and people, and is increasingly working closely for the benefit of clients with WPP’s data investment management group, Kantar. Together GroupM and Kantar account for over 50% of WPP’s group revenues of more than $20 billion. Discover more about GroupM at www.groupm.com.